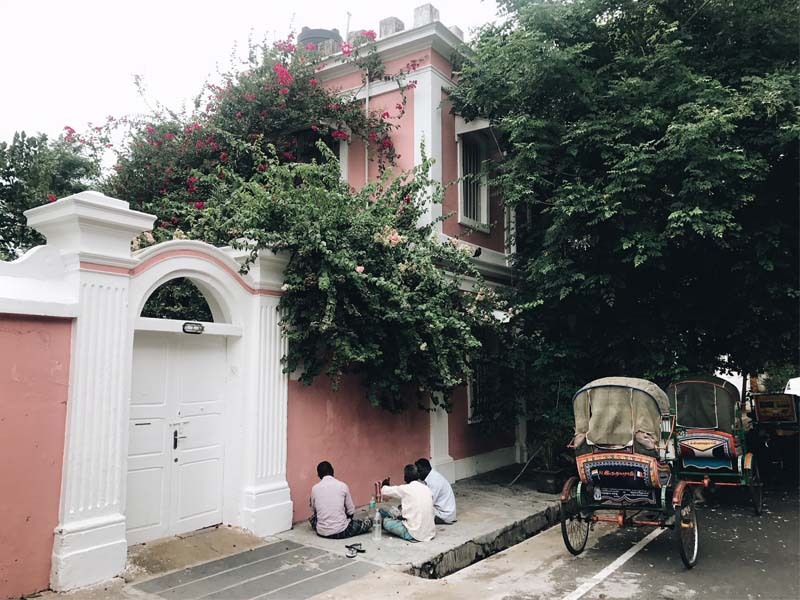 We’re lucky to be based out of the quaint town of Pondicherry, which is situated on the East Coast of South India. We are always inspired by architecture for our designs and this city is filled with architecture gold! A seamless mix of French Colonial and Franco-Tamil architecture, makes a stroll on the streets a gateway to history. 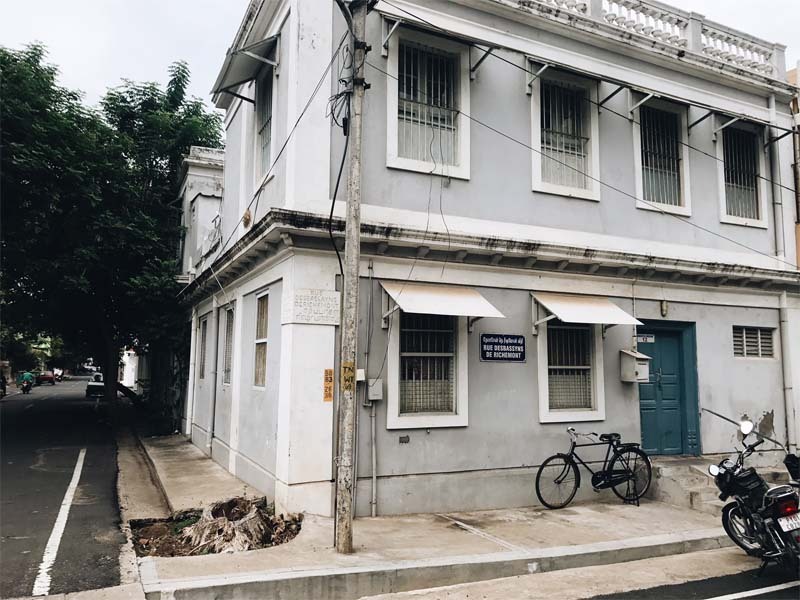 Read on for a compilation of some of our favourite architectural marvels and with expert insights on each from Devangi Ramakrishnan, an urban designer based in Pondicherry. Make sure you don’t miss out on these the next time you’re visiting! A modern interpretation of a classic Franco-Tamil style house. The pillared walkway is a key distinguisher of this style. 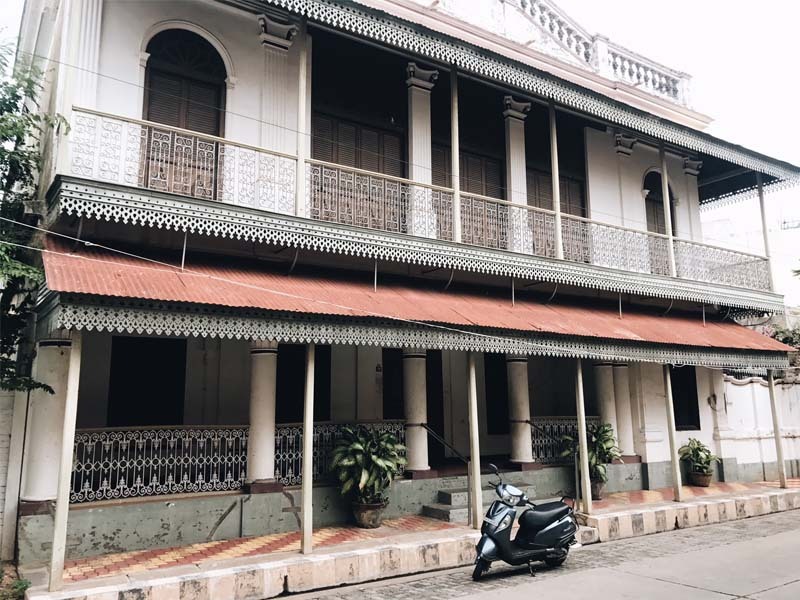 The style of balconies are one which you will see in abundance in Pondicherry and has almost become synonymous with the style of architecture in most Franco-Tamil houses. This is a great example of a newly constructed house that is sensitive to the traditional style. This gorgeous house hidden behind bougainvilleas is typically French Colonial, characterised by the house set towards the back with a garden space in the front. The arched doorway is also a common sight in many houses in Pondicherry. One of our favourites, in the Muslim Quarters of the Boulevard Town is this stunning edifice. 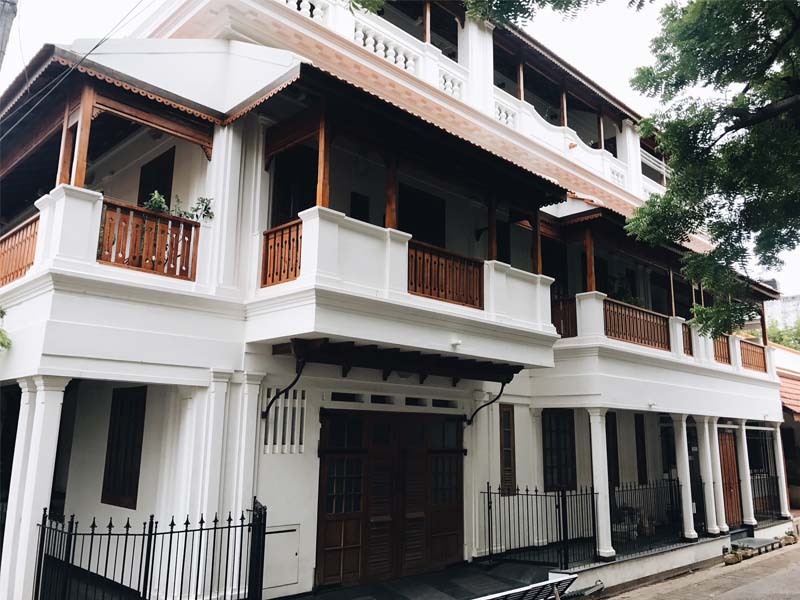 This Franco Tamil house is set apart by the ornamentation in the iron railing and the roof, which is almost Arabic. These residences usually have a deep verandah that runs along the length of the building facade. 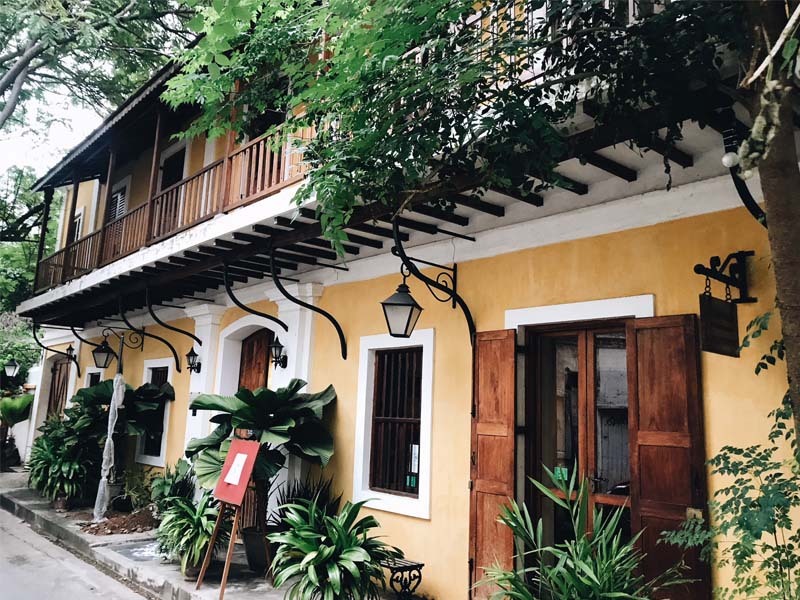 The iconic Hotel de L’orient is a heritage building that was restored in the year 2000 and propelled the conservation movement in Pondicherry. The structure dates back to the late 1760’s and you can still see the old signage above the entrance saying ‘Instruction Publique’, suggesting it was occupied by the Department of Education. The gorgeous wrought iron balcony over the entrance is typical of such public buildings. Many newer buildings have taken inspiration from this and you will find this style in abundance. A typical example of an Ashram building. They are easily identifiable by their grey and white colour scheme. The white outline highlights all the structural details of the building. This is also an example of a Franco-Tamil residence. It has gorgeous location just by the beach in Kuruchikuppam. The concrete pillars and the red metal roof are a later addition and are so incongruous, that they hide what must have been a beautiful and grand entrance to the mansion. Gratitude is quintessential Pondicherry. It encapsulates all the best features of French Colonial architecture. The house has been restored in collaboration with INTACH who are specialised in restoring and maintaining heritage sites across India. The beams under the restored balcony continue inside and hold up the first floor. The metal brackets in turn hold up the beams of the balcony. This is a very sensitive example of the traditional architecture and is the right shade of the Pondicherry yellow! These are some of our chosen favourites that really give us house envy! 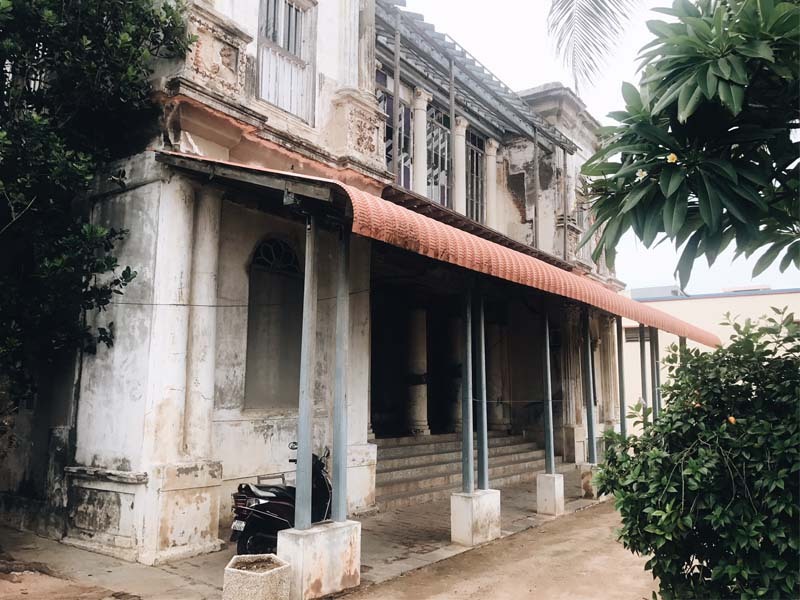 Unfortunately, while buildings have been listed as heritage in terms of archaeological and historical importance, there is lack of proper maintenance and many are torn down completely. The collapse of the ‘Marie’ on the beach road was a wake up call for many. We hope we have shone a light on the unique blend of European and Tamil architecture, that makes this quaint town so special. 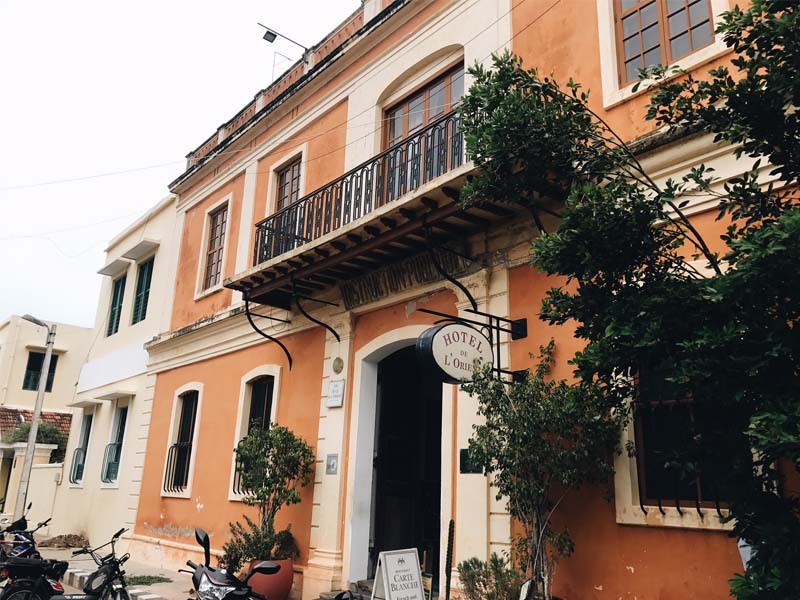 So the next time you’re here, hop on a bicycle or walk around the bougainvillea lined streets, to take an architectural tour of Pondicherry and get transported into a different time in history. Looks like a bit of a safety hazard with that tree trunk in the sidewalk. It’s pretty big though, not sure how you would go about removing it. The heritage buildings, though need to be preserved, do not withstand a mild seismic activity. How can safety be ensured in such an event? Obviously, the foundation cannot be reinforced, only superstructure can be given cosmetic touch by way of refurbishment. This needs to be thought of to preserve human lives.